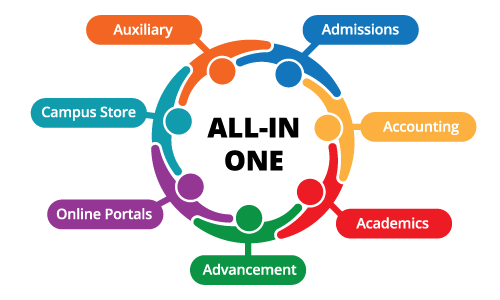 Efficiently Coordinate All The Activities In Your Academic Office with Registrar. Your registrar office is at the heart of what you do as a school. Your central student information system needs to handle a wide variety of academic tasks to keep things running smoothly. You need functions to manage student and parent data, faculty, departments, grading, scheduling, attendance, discipline, and much more. Boarding schools need additional features to handle special situations like dorm assignments and weekend sign outs. You need quick access to information, but you also need security for sensitive data. And, of course, you need your registrar software to be tightly integrated with your accounting, admissions, and alumni/development software. The suite includes Basic Scheduling and Dean’s Office. Learn more about our Ascendance Registrar module and its add-ons by downloading the product sheet. ✓ Supports block or modular scheduling, up to 14 days in a rotation, specified separately for each division within your school. ✓ Work on next year’s schedule can begin at any time during the year. ✓ Define unlimited courses and sections, including details about pre- and co-requisites, books, etc. ✓ Collect and summarize student course requests and faculty recommendations. ✓ Flexible scheduling process by student, by section, or by group, with conflicts clearly identified. ✓ Extensive reporting to spot and resolve problems, and review statistics and summaries. ✓ Create, print, and mail schedules and class rosters to students, parents, faculty, and staff. ✓ Add Schedule Builder/Loader to extend scheduling functionality with sophisticated algorithms for building and automatically loading schedules. ✓ Configure attendance and discipline entry/reporting separately for each division within your school to reflect differing policies. ✓ Enable daily attendance, class attendance or both. ✓ Supports unlimited attendance types and codes for meaningful summaries and reports. ✓ Boarding schools can track weekend sign outs and permissions. ✓ Easy to create customized discipline letters and mailings to students and parents.